A satisfactory tear-jerker which still managed some surprises despite all of this season's advertising spoiling the ending. 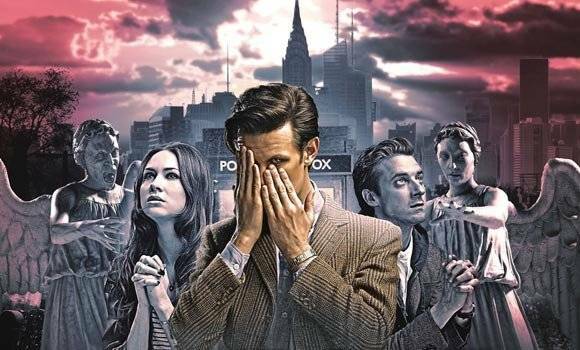 A trip to New York City goes awry when Rory is touched by a Weeping Angel and transported back in time to 1938. To his surprise, River Song is also there, playing detective and using the alias Melody Malone. Not coincidentally, this is the name of the heroine of the detective novel The Doctor had been reading out-loud when Rory disappeared and suddenly realized described Rory's abduction. The good news is, with some help from River, The Doctor is able to navigate the time turbulence that now surrounds New York City in the late 1930s. The bad news is that the four of them are now stuck in a trap - a farm created by the Weeping Angels where they can repeatedly hunt and recapture the same beings over and over. With The Doctor out of ideas, it will ultimately fall to The Last Centurion and The Girl Who Waited to save themselves and countless others from becoming Angel Chow. * First of all, this is a perfect departure for The Ponds. They're ready to die rather than be apart and they go out in a way that may not save the universe but it will save uncountable people from the pain that The Weeping Angels thrive upon... at least until the twist, which is still fitting. This fits the more personal theme of the episodes of the Series so far, which have focused more upon the actions of individuals to make a difference rather than grand, epic battles for the fate of the universe. * To the best of my knowledge, Doctor Who has never really done a film noir themed episode. For the most part, this episode didn't really capture that feel either but the opening with the P.I. being hired to investigate the angels by a crime boss is a good bit of genre writing on Steven Moffat's part. And River is quite the effective femme fatale. * Steven Moffat's script, in general, is amazing and all of the characters get at least one moment to shine. * Matt Smith gets his own great moment as The Doctor begs Amy to come with him after Rory disappears once more, back in the TARDIS, so they can go and see more wonders, like Peter Pan begging Wendy to come away on one more trip to NeverNeverLand. We see The Doctor's soul laid bare here and on the surface he seems much the same overgrown man-child who doesn't want the fun and games to end we've seen all season. But look into Smith's eyes and listen to the tone of his voice and you'll find the weight of ages - the old pacifist who changed himself rather than live with the fact that he'd turned every person he ever cared about into a warrior. The line also makes it clear - along with the earlier lines about not liking to think of Amy aging - that The Doctor still sees Amy as being the nine-year-old girl who helped her Raggedy Doctor during a confusing time. * Karen Gillan gets her own fine moments in the above-mentioned scenes. The Girl Who Waited makes it clear, twice, that she is not a girl anymore and that she will not have anyone making choices that will change her life forever on her behalf. * Looking back on the series so far, I'm almost certain now that most of those stories take place after this one relative to The Doctor's personal timeline and that The Doctor went back to spend some more time with The Ponds after seeing them for the last time. I think it would explain a lot of his clinginess. * It's a minor thing, but I am somewhat annoyed that the last we see of Rory is his being touched by the Weeping Angel. The ending with the young Amelia finally getting to see The Doctor and the idea that she will hear the story of her life is a good one...but it entirely reduces Rory's role on the show to that of an accessory for Amy! It's doubly annoying because Series 6 had done so much to develop Rory past being "Mickey The Idiot, Mark II" and so much of Series 7 reduced him to the standard bumbling male companion role. A quick flash of an older Rory and Amy, happy together, would have made this perfect. * The plot thread with the crime boss Grayle isn't explored very well and is dropped rather suddenly. He seems to be working with the Angels or studying them at different points. Really, apart from adding to the film noir mystique early on, there's not really any point to his whole arc. * Another minor point - The Doctor's healing River with a bit of his regeneration energy bothers me in how badly explained it is. I'm assuming he can only do that to other Time Lords, because it would have been useful for him to cast Cure Moderate Wounds like that several times in the past. Would it have taken that much time to explain that it was something he could only do with a Time Lord? The Ponds get a surprisingly subdued but fitting send-off. The cast are all given their moments to shine and Steven Moffat's script is generally amazing, despite a few plot holes and things that could have been better explained.